If you need a bit more background info here is a brief definition of the term user experience. Other than that: the following figure shows the big picture (which is in fact just one big picture from the many possible ways of looking at user experience). 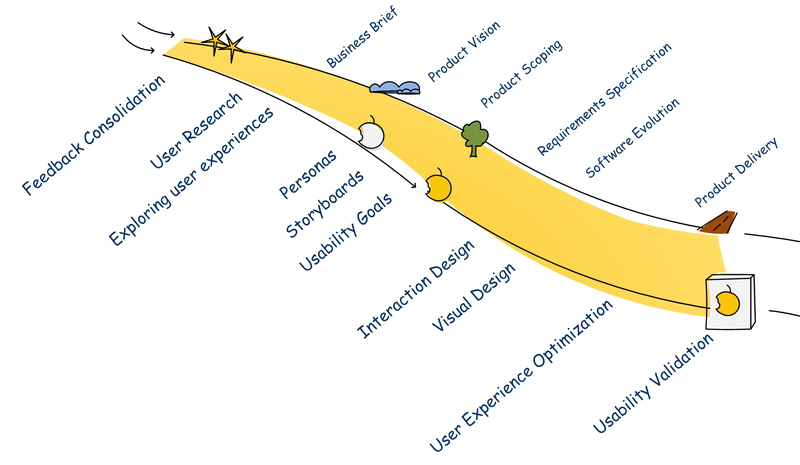 The user’s experience is both starting and end point of user centred development. The starting point of a new product can come from what users love and hate today. Someone simply recognizes an opportunity by seeing people struggle in their daily live. Therefore, building knowledge about “users, their life, their work and their dreams” (many thanks to google for this) is a great first step to take to seed ideas. Feedback consolidation gathers and visualizes existing knowledge about users, their experience and solutions from the different stakeholders within the company. A simple method for this is visual feedback consolidation (Article for German speaking readers). User research gathers and consolidates the knowledge directly from the users and detects so far unidentified opportunities and feeds it into the innovation process. A powerful method for this is contextual design. A simple way to present the consolidated information is an experience map. Such a map can show where in the user’s journey the company is involved, does a great job and consequentially wins new customers. It can also give insights about where the company isn’t involved at all or even worse, does a lousy job and looses customers. An experience map can visualize the extract from user research and feedback consolidation (Source: User-Centred Engineering – creating products for humans). In the process of building up knowledge, insights and ideas will pop-up. Some ideas may convince a business person to drive the idea because she can see a good profit and a technological person to investigate the feasibility because she is somewhat optimistic that the idea can be built in a useful time and with acceptable budget. Such ideas actually reached star level. At this stage, a first NABC sheet might visualize the key aspects of the idea, a simple four image storyboard could give a first impression of the user experience. Depict an idea with four simple images of how users will use a product. To bring an idea onto cloud level, the team needs to dig deeper and e.g. do some market research, create business plans, run some feasibility studies, look at possibilities to change existing processes, competing products and more. User research targeted to answer specific questions allows to gain more insights to feed the creative process of envisioning a future experience. Sketching out user experiences simulates a future world that can be tried and tested by users. It allows to learn what could matter and work in such a future world and how users would behave. Personas consolidate the insight about users into a character and thus focus the product on the key properties of the future users. Storytelling, e.g. with a storyboard or a video prototype, is helpful to show in more details, how the world tomorrow will look like and how the product fits into this world. A service blueprint shows the important touch points and channels and what needs to be adapted and changed to allow for the new product. During this process, the ideas evolve step by step into a sound product vision. The technology experts get confident that they can actually build it and how they would do it, the sales people have a good idea about how and when to distribute it and the business guys in the company walk around getting enough money to start development. The idea has reached cloud level and it should be quite easy to create a convincing business case. 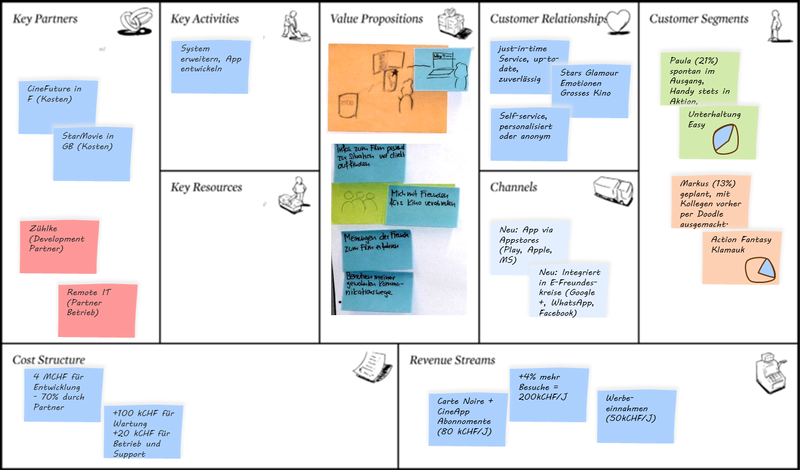 A simple way of showing the key aspects of a business case: a business model canvas. An idea on cloud level could be substantiated with a business model canvas to give the business facts, a one page product brochure (or a product vision box) telling why for whom what is created how and until when, and finally a snappy pitch to catch peoples attention. a powerful story that can inspire a dream. All of them can incite the needed desire “this is cool, we must have it” to venture into the unknown. So lets assume that managers are inspired, want the products and well, just actually granted half the resources estimated. Lets further assume that the idea makes it into a slot in the R&D department, marketing frees some resources to create a matching campaign, sales is willing to adjust their processes and management also finances the the organization changes to deliver the services around the product. Bringing the idea on tree level, i.e. agreeing on what really needs to be done is now the key. The lean concept of a minimal viable product is a great thinking tool here. The working tool to achieve the minimal viable product is user story mapping. The result is thus a first version of the user story map, showing the backbone as well as a bunch of stories for the walking skeleton and the first product release. In this stage UX experts need to focus on the essentials: which Persona should drive the design? What is the one most import goal (“There can be only one”) to achieve and in what way does the user experience contribute to this goal? What user stories need to be added to the story map and what are important acceptance criteria for stories? UX goals (ranked!) tell the team what to optimize for. Storyboards showing how the personae act with the new product serve as the backbone of the user story map. The development team can focus on achieving the targeted user experience rather than implementing functions! The development team might also add a few features to collect feedback once the product is on the market. The development team can now just take the idea from trees down to the road: They start the agile development. They evolve the product iteration by iteration and add functions, refine the products and refactor it. It is important to note, that the users’ experiences of a product are not just formed by the product. Marketing campaign, services around the product, packaging, product descriptions, online-platforms, handbooks and more contribute. And of course, there is a lot more to a product than just the development itself. Thus in the same go, the team creates marketing materials, prepares the sales channels, builds up production capacity, acquires needed certifications, runs validation tests and so on and so on. With a sequence of wireframes it is easy to specify the details of a user interface. The team applies techniques from interaction and the visual design to create an attractive user interface of the product. UI concept, emotional design and UI details need to be worked out, changes incorporated and visuals fine-tuned. With usability and user experience tests the team gathers feedback from users to optimize the user interface. The UX goals indicate what to optimize for and how to evaluate best. The usability goals can be detailed into UX performance indicators and thanks to some added functions in the product even measured. The team validates the UX performance indicators during this stage. With a big party, the product enters the market. Finally, customers are buying and user are using it for real. It’s time to start gathering feedback and to improve the product. The added functions to collect UX performance indicators, usage statistics and feedbacks from users provide the data needed to focus on UX hot spots. Trends (e.g. after a release) as well as snapshot data give valuable insight. Regular on-line questionnaires can be used to assess the user experience, and especially the changes to the user experience over time and product release. In some cases (e.g. web sites with heavy traffic), A-B testing can be used to let an improved version compete with the current version. Do the UX performance indicators get significantly better? With all this great stats methods teams easily forget that it is all about humans. So don’t hide behind usage statistics and questionnaires! Go and see for yourself, observe and understand your users!! Doing User Research and Consolidating the Feedback is Again The Most Important Thing to Do! I apologize for my shouting here. Sometimes one needs to whisper to be heard sometimes one must shout. I tried my luck with shouting. Well then. With all this work on getting the product even smoother, someone might come to the conclusion that there should be an even better product with some new and cool features. And if a business person and a technical person buy into it, an idea reached star level and the UX innovation flow continues. This entry was posted in 02 - Agile and user centered innovation and tagged Business Model Canvas, Contextual Design, Experience Map, Feedback Consolidation, Focus on Users, Mock-ups, NABC, Personas, Powerful Story, Service Blueprint, Storyboard, Storytelling, User Experience, User Experience Sketching, User Story Map, UX Goals, UX Performance Indicators, Video Prototype by markus. Bookmark the permalink.